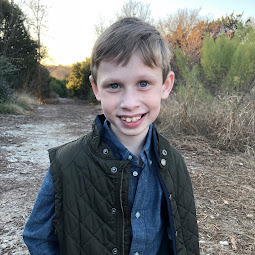 Bennett Brinson Gamel: Fighting Cystic Fibrosis: "When am I going to die?" 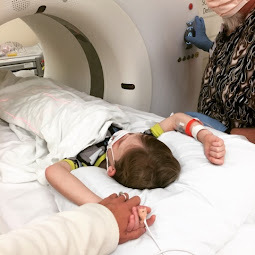 One of the hardest things about raising a child who faces a premature death is knowing that one day your child will come to know he faces a premature death. I had heard from other CF moms that this often happens around upper elementary/junior high when children end up reading independently about Cystic Fibrosis and stumbling upon the reported life expectancy for those with the disease. What I had not known is: sometimes, kids figure it out earlier. 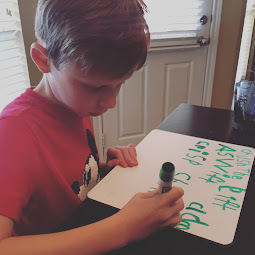 Last month, after recognizing Bennett's irrational nighttime fears were becoming so draining for us at bedtime and that his unregulated behavior was becoming a problem at school, we arranged for him to begin play therapy. I suspected something was going on, but I wasn't exactly sure what. Play therapy is similar to talk therapy except instead of communicating through words, play therapy allows children to communicate their thoughts and feelings through the language of play. The beauty of play therapy is children are able to open up about their feelings in their own way and on their own time. It was only their second session together when, while playing with a plastic superhero toy and plastic animals on the office floor, Bennett stopped his play, looked up at his play therapist and said solemnly, "my superhero died and all the sleeping animals are freaking out." This was a powerful moment, according to his play therapist - the first time Bennett introduced the theme of death in his play, providing us all a window in to his internal thoughts. His superhero toy represented himself in his play. A few days later, I found no amount of coaxing, punishing or rewarding seemed to keep Bennett in his bed to go to sleep. 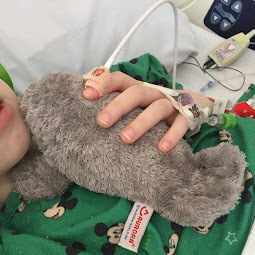 Sensing that it was intense fear preventing him from falling asleep, I finally laid down in his bed next to him and suggested that we pray that God would place angels around his bed to keep him safe. At that point, Bennett turned to me and asked, "but what if I'm away from you? Like under the sand with the crocodiles?" Suspicious that he might be alluding to death, I decided to give him some kind of confidence that even in death, he would be ok. I explained that God loves him even more than his father and I could ever love him. And, I explained, even if he would ever find himself away from us, God would be there to keep him safe. Bennett began to share about his fears about spiders and squids and sharks and kings (yes, kings, the bad ones). I explained that angels would protect him from spiders, that squids and sharks were in the ocean far away, and that kings are typically not bad and not ones to fear. Bennett then asked, "What is heaven like?" Despite the glow of the night light the dark room hid my tears as they began to stream down my face. I knew that what I told him in those moments would begin to create a picture for him of what it would look like for him to leave earth one day. I shared how it is the most beautiful place with everything good and nothing bad in it. I shared how it has all of his favorite toys in it, balloons and lots of gummy bears to eat (all things I know he loves). I reminded him his great grandmother is there and that God is there ready to care for him. Bennett's eyes got big and he seemed pleased with this answer. Eventually he digressed into a one-sided conversation on Power Rangers. Sensing he finally felt safe, I suggested that I leave and that he go to sleep. Oh, how my heart broke. How could I be hearing these words come from my five year old!? My son, who doesn't even know how to tie his shoes, was expressing how much he doesn't want to die...a fear that even most adults don't want to face in their most honest moments. Bennett sobbed and sobbed. I rubbed his back, wanting to sob alongside him. When he finally calmed down, I asked, "why do you think you're going to die?" to which he replied, "I don't want to grow old." What I eventually realized is his five year old mind associates "growing old" with death. A week later, during the first few minutes of his third play therapy session, Bennett sat down and asked matter-of-factly to his play therapist: "When am I going to die?" His play therapist, a bit caught off guard, answered, "I don't know when you're going to die. I don't think anybody knows. It's hard not knowing, isn't it?" After a reflective moment, Bennett nodded and said, "God is the biggest in the whole world. And God doesn't die... does he?" It was his effort to reassure himself that if she didn't know when he was going to die, at least he knew God would never die. At the urging of my therapist who thought Bennett might actually believe his own death is truly imminent, Brian and I recently sat down and talked with Bennett about his fears of his death. We reminded Bennett that his lungs are healthy right now and that he is working hard with his treatment so there is nothing to indicate to us that he is going to die anytime soon. Brian and I shared that, even though we don't know when exactly he is going to die, we fully expect him to go to kindergarten next year... and then to eventually enter the 3rd grade...and later to enter junior high. We shared that we, as his parents, fully expect him to graduate from high school, go to college, and to become a grown man. And, we shared, we hope, he might even be an old man one day (to which he clarified he had no intention of being - since old men die). This all seemed very satisfying to Bennett. We have noticed a great improvement in Bennett's behavior and nighttime fears since this conversation. Even the play therapist has indicated she can tell in his play that a weight seems lifted from him. Maybe he finally has some inner peace regarding some of these thoughts he was carrying around? It's normal for children to think about death. But it's not typical for a five year old to worry about his own mortality. Bennett's fears over dying are directly born out of his life experience with Cystic Fibrosis. We aren't exactly sure where he got the idea he is going to die soon. We have never told him this. But even the play therapist wasn't surprised to see him work through these things. Kids with diseases like his often do. Until recently, Cystic Fibrosis has been Brian's and my disease, one that Brian and I have carried for Bennett. CF affects Bennett's body but, Brian and I, we have carried most of the emotional weight that comes along with knowing his disease is progressive and that, barring a cure, things aren't going to get better... that CF will take Bennett's life eventually. But, slowly, as Bennett awakens to the world around him, he is beginning to confront what it means to have cystic fibrosis. It's hard to see him have to wrestle with these fears, but I am thankful that we are given time to do so together, in small increments. Thankfully, Bennett isn't going to learn about CF all in one day when he's 18. His understanding about his condition, the challenges he faces and his need for a cure is one that will emerge slowly over time. I see this as a huge blessing. God will give us the strength we need to cope through each new understanding over time. I pray to God I will never have to experience Bennett's premature death. But I also have to be honest with the reality that Cystic Fibrosis is a disease of slow death. Every living thing dies. It's just that most of us, especially when we are healthy, don't have to think about it. As I fall asleep myself tonight, I am thankful to be a part of such a meaningful moment in my son's life... the beginning of his own reconciling that life on earth is not forever.